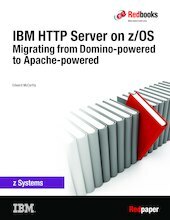 Users of IBM® z/OS® for the past several years had a choice of two HTTP Servers that they can use. Now, one server became strategic while the other is no longer supported with z/OS V2.2. IHS powered by Apache supports IPv6 and 64-bit execution and includes security authentication and authorization capabilities that are similar to those capabilities that are provided in IHS powered by IBM Domino®. This IBM Redpaper™ publication is aimed at technicians who are responsible for planning and deploying system software. It provides informationon about the various features that are available in IBM HTTP Server powered by Apache. It also provides guidance about how to upgrade from the old product to the new product.